The luxurious limousine WordPress themes are put together for limousine, car rental and hire services, bus and coach, taxi and airport services, vehicle and transportation, moving and delivery organizations and agencies. If you are eager to direct more attention to your well served and high quality limousine and car rental services for different occasions and anniversaries, events and parties, having a strong and professional website is compulsory. Standing apart with your own profile and user centric working approach can do wonders when it comes to winning the modern competition in the relevant field. All of these limousine WordPress themes are a mixture of cutting edge technology and tried and true coding principles. It means that your website is going to be secure and durable on the one hand, and visually stunning and modern on the other. Choose any of the below mentioned templates and make sure you can market your car and wheel based services in the most economical way. Best prices are guaranteed with these limousine WordPress themes. You can save your money while getting access to a multitude of controls and options to make your online profile exclusively good. They are also extensively flexible so that you can establish your unique style and special typography so that your potential clients can quickly identify your limousine or car rental or dealing business versus others. If you own a seasoned car rental business with a large group of clients or need to find a way to grow your startup rental company, Car Rental can one of the most useful limousine WordPress themes you can try. Place your cars and vehicles in front of your potential customers and let them go through all the available options and tips before making a final decision. They will certainly evaluate the favorable conditions you have provided for them via Car Rental, since this theme is awesomely designed with end user’s seamless web experience in the developer’s mind. Once can find adjustable layout and handy admin dashboard from the backend of the theme, fonts and colors management options, pre enabled shortcodes to accelerate your work, multiple layout choices, etc. Perfect Logistics is the next clear and objective, purposeful and deliberate car and car relevant template ready to bring your moving and packaging, transportation and postal services, car dealing and rental, limousine and other relevant websites and blogs. Use all the productive content areas and sections of the theme to give the needed information to your audience and build strong relationships with them via contact from, footer and header area with contact details, social media links and more. The prebuilt ecommerce compliant character of the theme makes it possible for you to exercise any kind of commercial transactions online with the help of WooCommerce or any other relevant plugin. This responsive and mobile friendly theme is also unbeatable in HD and retina ready nature to transmit also visual information and result in more attendance. Auto Car is the next auto and automotive based website building solution to be easily practiced both by experienced webmasters and non techy website admins with no coding experience at all. Any business in the car rental and dealership, sale and repair spectrum needs a reliable online platform to get tangible results and not to miss a single client. Auto Car is developed by taking into consideration all the modern tips that auto car industry can use to yield higher revenue. As such, this template celebrates search engine optimized nature for SEO purposes, 100 % responsiveness to bring mobile and device users to your pages, as well as translation readiness for you to greatly benefit from the advantages of a multilingual ready website. 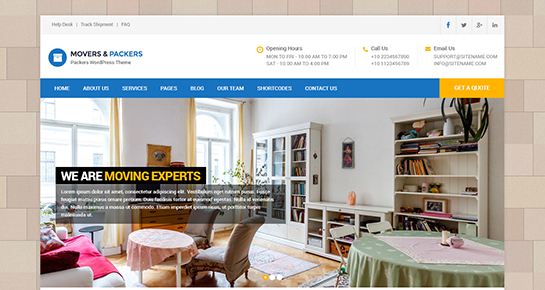 Another ideal website tool among limousine WordPress themes for trucking and transport services, automotive rental and sales is called Movers and Packers. Whether you are specialized in providing luxury cars for weddings and other festive occasions or represent a chain of moving and transportation companies across the world, Movers and Packers Pro will look its absolute best. Your car rental or moving business should be appealing to your online audience. Therefore, Movers and Packers Pro has been designed with the highest peak of carefulness and accuracy to demonstrate your site in a presentable fashion across an avalanche of hand held devices. Moreover, you can take the template and make it totally yours with specific typography and color mixture, calls to actions and social icons, page and post controls. Another useful template for car rental and towing, mechanic and garage related websites and profiles comes launched as Towing. Let your customers make a journey through your convenient cars and vehicles, see their availability and prices, technical details and more, get in touch with you for additional questions and inquiries via contact form, etc. Quick performance and smooth navigation add a charm to the overall template so that you can be sure your website viewers are not irritated by any heavy loading or uncluttered operation of the site. Fully translation ready nature of the theme makes it quite possible to satisfy the linguistic needs of different language bearers and international audience. Other plugins such as shortcodes, gallery and commercial ones have also been tested with the theme. Spirited Pro is the last serious looking and highly recommended website ecosystem you can find among the best limousine WordPress themes as for now. Be one of the leaders in your marketplace and record a dazzling success with Spirited Pro that is fully controllable and easy to customize, user centric and admin optimized. Amuse and delight your guests and customers with a designer made web environment and accurately arranged content about your profile, car rental services, mechanic and repair services and more. Add and test different compatible plugins for better contact form, serviceable gallery and albums, homepage slides or boosted SEO results. The theme is also HTML5 and CSS3 based with shortcodes and fonts packages included by default. This entry was posted in wordpress themes on March 6, 2019 by SKT Posts Themes.